Female riders have taken part in Saudi Arabia's first women's cycling race, surprising many people in the conservative nation and across social media. Saudi women cyclists were able to compete in a race held in the city of Jeddah on Tuesday. Forty-seven women competed in the 10-kilometre race, which was organised by Be Active, a group bringing together women cyclists and local authorities. In a statement to local media, race organiser Nadima Abu al-Enein said she was surprised by the number of cyclists in attendance. "The large participant turnout prompted the organizing committee to increase the allowed number of participants from 30 to 47 girls," she said. "However, the committee was still forced to exclude numerous others who hoped to participate." Although the event received positive reactions from some on Twitter, it proved to be controversial for others. A Twitter user commented: "I am not a religious cleric but a woman can be seductive and getting on a bicycle reveals all her attractive parts to men. If she wants to ride a bike she must do that by herself and not in public nor in front of people." Another user said women sports are needed, "but within limits and not in front of men". Many Twitter users praised the cyclists and organisers. @p9p___ said the event "looks like so much fun." @foof_foofa praised the city for staging the race. "We don't care about your objections," she tweeted. @N9n9Ta replied to critics of the race: "In five years or 10 or 20, the women who are criticizing the event on social media are going to take part in similar races or will attend them and cheer on those racing. Just like they did with mobile phones, televisions, schools, nursing, medicine... They'll look back and be embarrassed by the way they reacted." 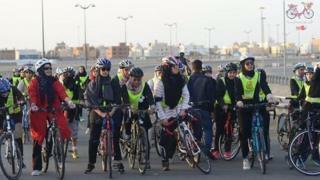 Ms Abu al-Enein set up her bicycle club in 2017, using social media to recruit fellow Saudi female cycling enthusiasts and raise the awareness around cycling for both Saudi women and the wider population. In an interview with Cycling Today, she described the difficulties she and her fellow riders faced when riding in the country, but said the number of women cyclists grow all the time. In 2013 the authorities in Saudi Arabia decreed women are allowed to ride bicycles in recreational areas on condition they dress modestly and are accompanied by a male guardian at all times. On Monday, Jeddah was also announced as the potential home for the first opera house in Saudi Arabia, as the nation prepares its Vision 2030 plan of social change.